Indian food is one of the most colorful savory food in the world, of course in my point of view. At least 3 colors you can find in any Indian dish: red, yellow and green. I have figured out an enigmatic coincidence of Indian traditional costume and food: they are both very colorful. I’m not kidding, I truthfully conceive that thing as I had a chance to join an Indian party last year. Listing the condiments’ names can acquire you one thousand and one nights as the princess Scheherazade had to spend those equal nights to tell the story to avoid the death penalty. I don’t wanna flood you in those condiments. 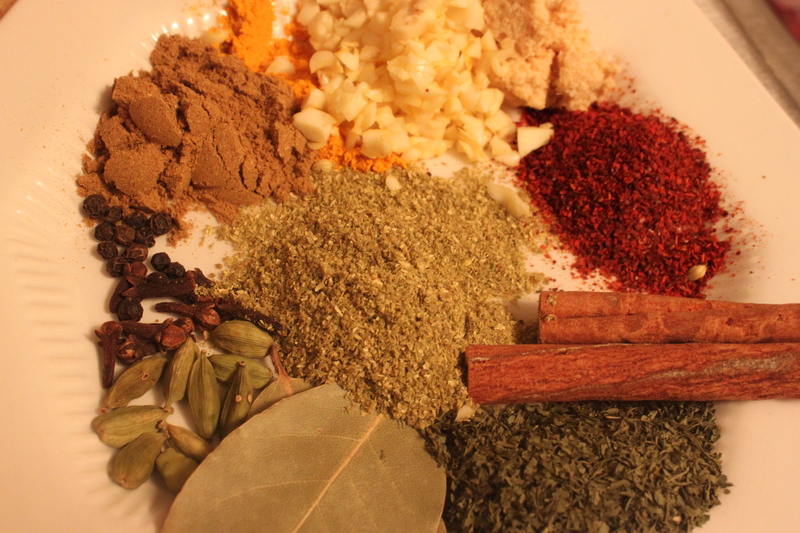 You have to know several basic seasonings to make a good Biriyani. 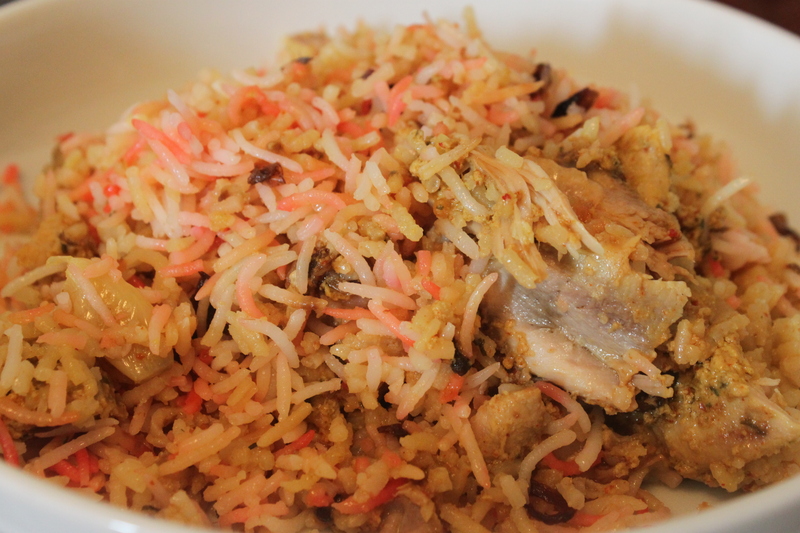 In Persia once upon a time, Biriyani meant “roasted” or “fried” and that decent food was served for Kings. It’s so happy that we’re gonna eat a royal food, aren’t we? This following picture shows you all the condiments needed for a simple Biriyani ( I don’t have mace, mint and nutmeg on hand but my chicken biriyani turned out really resembling what I ate in the Indian restaurant). Don’t be intimidated or run away. You can easily find these condiments in any Indian grocery or any store that sell seeds for planting. Biriyani is really good if you’re on a diet due to the low calorie. The only trick to cook a perfect biriyani is to strain the yogurt before marinating the chicken. It will prevent the half boiled rice to be so mushy during the cooking process. – Combine all the seasoning with oil + yogurt + salt then massage with the chicken thighs. Let it sit for 30 minutes while you’re preparing the rice. – Bring 4 quart water to a boil with 1 tbsp cooking oil + 2 tsp salt. When the water comes to a boil, add the basmati rice and cook for 4 minutes, exactly, otherwise your rice would be so soft and become mushy in the later step. – Strain the half boiled rice immediately to drain all the excess water. – Fry the chopped onion until it’s brown. – Add all the marinated chicken in a large stock pot to make the first layer. – Add the rice as the second layer. – Mix the red color with 3 tbsp water and “sprinkle” it together with the onion onto the rice layer. – Bring the stock pot to a boil at medium heat for around 5 minutes. Then reduce the heat to low-medium heat for another 25 minutes. After 30 minute cooking, bring the heat to medium high for 3 minutes then the biriyani is done. – Serve: stir the rice gently with the chicken. The rice is fully cooked but no mushy. This entry was posted in Indian and tagged chicken biriyani, indian, rice, spicy. Bookmark the permalink.